We have come together this afternoon into this church dedicated to the honor of the Sacred Heart of Jesus to witness the exchange of consent between Michael and Abbey. We have come to celebrate with them as today they “establish between themselves a partnership of their whole life,” which, by its very nature, “is ordered to the well-being of the spouses and to the procreation and upbringing of children.” They will begin this partnership in this church because marriage has “been raised by Christ the Lord to the dignity of a sacrament” as an external sign of the love of God (canon 1055). On their behalf, I greet you, their family and friends, with affection and I welcome you in the name of Christ. I thank you for the love, support, and encouragement which you give them by your presence with us today and am confident they will be able to count on you for this same encouragement, support, and love in the days, weeks, and years ahead. Now, my friends, before we witness the exchange of their promises to live the remainder of their lives together in committed love, I ask you to allow me to speak directly to the couple; you, of course, are invited to listen in. Michael and Abbey, you have chosen for us to hear these words from the Letter to the Hebrews: “Let mutual love continue” (Hebrews 13:1). In modern English, we unfortunately have only one word for love, and so we say I love you and this dog and this book and this pizza; we use the same word without linguistic distinction and lose something in the process. The unknown author of the Letter to the Hebrews, however, knew three Greek words for love, each with its own particular meaning. When he wrote, “Let mutual love continue,” he wrote, “Let mutual philia continue.” This word is at the root of the name of the city of Philadelphia and refers to the “love of friendship.” Of the three forms of love known to the ancient Greeks, this love of friendship was the second. The first form of love was called eros and was a “possessive or covetous love,” even a “worldly” love. They called the third form of love agape, a love without self-interest. Likewise, King Solomon knew of two Hebrew words for love when he composed the Song of Songs. “First there is the word dodim, a plural form suggesting a love that is still insecure, indeterminate and searching” and in this way is very much like the Greek eros. This comes to be replaced by the word ahabà, which the Greek version of the Old Testament translates with the similar-sounding agape, which … becomes the typical expression for the biblical notion of love. By contrast with an indeterminate, “searching” love, this word expresses the experience of a love which involves a real discovery of the other, moving beyond the selfish character that prevailed earlier. Love now becomes concern and care for the other. No longer is it self-seeking, a sinking in the intoxication of happiness; instead it seeks the good of the beloved: it becomes renunciation and it is ready, and even willing, for sacrifice. This love is like that of agape and is very much like the love of Christ Jesus for his Bride, the Church. It is generally the love of eros, a self-seeking love, which first brings a couple together. If this love of eros does not develop into the love of philia, into a love of friendship, the relationship will fall apart under the weight of narcissism. And if the love of philia does not then develop into the love of agape, into a selfless love, the relationship will remain one of mutual convenience, but it will not become the love intended by the Lord for Christian marriage. As you first called out to each other with the love of eros, “Arise, my beloved, my dove, my beautiful one, and come,” so now today you yearn to say to each other in the love of agape, “stern as death is love… Deep waters cannot quench love, nor floods sweep it away” because it is not concerned with itself (Song of Songs 2:10; 8:6-7). It is because your soon-to-be married love is always to reflect the love of Christ to the world for his Bride, the Church, that we heard this admonition, “Let marriage be honored among all and the marriage bed be kept undefiled” (Hebrews 13:4). The call to honor marriage strikes against two opposite errors. On the one hand, some early Christian heresies, especially forms of Gnosticism, condemned marriage on the grounds that matter is evil and bodily pleasure is unworthy of those who seek to be spiritual. Paul’s letters vigorously combatted this error, affirming the exalted dignity of marriage as a sign of Christ’s own relationship with his bride, the Church (Eph 5:31-32; see 1 Cor 7:7; 1 Tim 4:3-5). The opposite error, which is much more characteristic of Western culture today, is to condone various forms of sexual activity outside of marriage, on the grounds that what one does with the body is insignificant. The language used by Hebrews, let the marriage bed be kept undefiled, implies that the sexual union of spouses is something intrinsically holy that we must take care not to defile. It is intrinsically holy because the two of you, like all husbands and wives, are called by the Lord, through your marriage, to remain always in his love (cf. John 15:9). Through the grace of the sacrament marriage, the Lord invites you to enter into his Sacred Heart, to make your home within it even as the dove dwells “in the clefts of the cliff” (Song of Songs 2:14). Among the words of profound spiritual counsel left us by Saint Marianne Cope, one of my favorites saints, are these: “Creep down into the heart of Jesus.” The reason she tells us to do so is simple: “He alone can comfort you in your supreme hour of sorrow.” These might seem strange words for a wedding homily, but the truth of her words cannot be ignored, nor can the reality of marriage as a form of the cross, in that marriage requires a daily renunciation of oneself in favor of the spouse to be a reflection of his love. We know that “love is the foundation of everything,” including marriage and the Cross, but just as there is a temptation today to over-romanticize love, so is there a temptation to over-romanticize marriage, to think it will somehow automatically bring about a life of bliss without any difficulties whatever. The reality, however, as any honest couple will tell you, is not quite so picture perfect. Marriage is difficult and requires compromise, patience, and gentleness, but when the difficulties of marriage are embraced, when your mutual love continues and you set each other as a seal on your hearts, marriage is beautiful (cf. Hebrews 13:1; Song of Songs 8:6). Just as the Cross is difficult, so, too, can marriage be difficult; but in the same way, just as the Cross produces joy within those who embrace it, so, too, does marriage (cf. John 15:11-13). Like the Christian life in general, marriage is simple, but it is not easy; marriage is simple because, at its core, it involves only one thing, namely, the taking up of the Cross. In marriage, you, Michael, must always put Abbey’s good before your own; likewise, you, Abbey, must always put Michael’s good before your own. If you live in this way, you will indeed keep the commands of the Lord and you will honor marriage (cf. John 15:10; Hebrews 13:4). All of this, of course, requires a repeated and continual – even daily - embracing of the Cross. 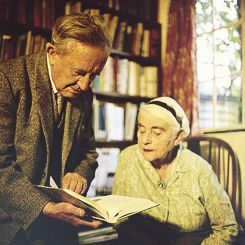 Tolkien here speaks of a danger for the groom in marriage, but lest some think marriage brings no danger for the bride, we might note also the temptation of the wife always to be right, even when she is not. Marriage, for her, too, requires deliberate conscious exercise of the will, that is, self-denial. I do not want the two of you to be unaware of this; this is why I gave you Mother Marianne’s counsel to creep down into the heart of Jesus, for his Sacred Heart is always intimately connected with his Cross. How fitting, then, even providential, that you begin your married life together in this church dedicated to that Heart which was pierced for us in love and which remains open for us as a safe harbor in the storms of life and a happy home in the joys of life. Creep down together, then, into the heart of Jesus each day of your married life. Look around within his heart and poke around, exploring each day what it means to love fully and to love “to the end” (John 13:1). As you help each other creep down further into the heart of Jesus to conform your hearts ever more closely to his own, you will help each other to become saints, which is, of course, the first and primary purpose of marriage. Then you will be able to emerge from his Sacred Heart to love as he loves, teaching each other – and all who see you – how to do the same. May your mutual love, soon to be bound in the love of God through marriage, show to a darkened world the bright light of love so that, together with you, we may all find our home in the heart of Jesus. Amen. Pope Benedict XVI, Deus caritas est, 3. Mary Healy, Catholic Commentary on Sacred Scripture: Hebrews (Grand Rapids, Michigan: Baker Academic, 2016), 286.